I see some traffic in the Web Sessions List, but some traffic (for example, from a specific program) seems to be missing. Check to see if any Traffic Filters are enabled. Check the Process Filter in the toolbar. If you've written or set any Fiddler Rules check those too. Click Help > Troubleshoot Filters.... When you do so, traffic that would otherwise be hidden is instead shown in a strikethrough font. 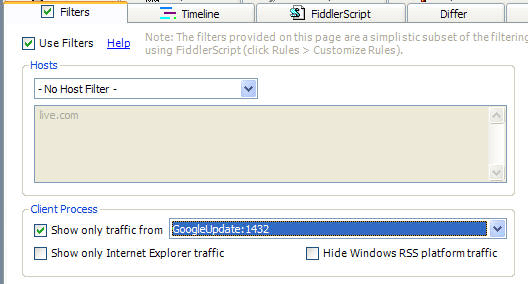 The Comments column will show which of Fiddler's filters was responsible for attempting to hide the traffic.